This NORMAPME SME User Guide intends to lend support to the efficient use of ISO 26000 by European small and medium-sized enterprises (SMEs). While ISO 26000 follows a global approach, this guide includes only recommendations that may be relevant to European SMEs. The PDF document can be downloaded from www.normapme.eu or from here. In supporting the promotion of the NORMAPME user guide a set of slides can be downloaded, which focuses on the essentials. It may be helpful for getting a quick orientation. Readers of this website may feel free using the slides for their own purposes. Some marked text has been taken from ISO 26000:2010, reproduced with the permission of the International Organization for Standardization, ISO. This standard can be obtained from any ISO member and from the Web site of the ISO Central Secretariat at the following address: www.iso.org. Copyright remains with ISO. NORMAPME would like to express its appreciation for the supportive comments received on this SME user guide from the leadership of ‘ISO/TMB/WG SR Social Responsibility’, the working group responsible for the development of ISO 26000, and from ISO central secretariat. This NORMAPME SME User Guide intends to lend support to the efficient use of ISO 26000 by European small and medium-sized enterprises (SMEs). While ISO 26000 follows a global approach, this guide includes only recommendations that may be relevant to European SMEs. What is the ISO 26000 standard on “Guidance on Social Responsibility"? In consequence ISO 26000 must not be referenced in contracts or governmental regulation, and – since it does not contain requirements – it must not be used for assessment or certification. An assessment would need to score the ISO 26000 issues (e.g. to what degree the guidance on a particular issue is followed) and would thereby transpose the guidance into a measurable requirement. Particularly, SMEs should be aware of this because certification bodies may offer assessment, an “ISO 26000 Certificate” or include ISO 26000 into other certification packages, all being an evident misuse of the guidance standard. What i s a European SME? 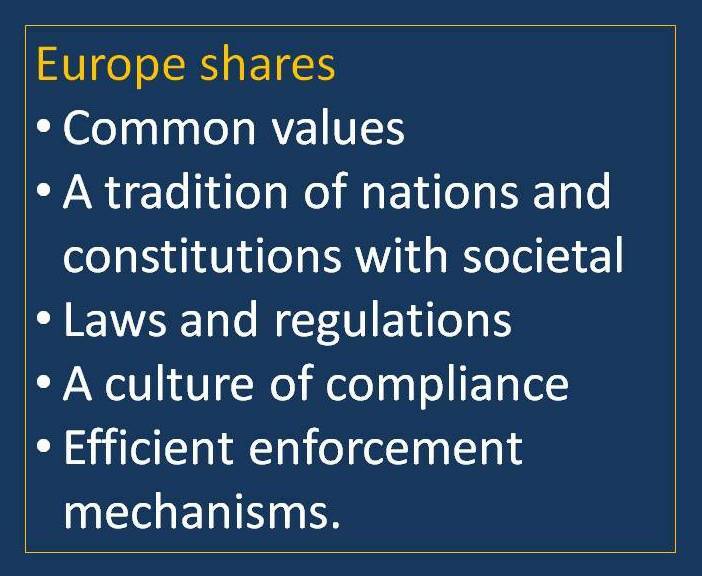 Europe shares common values, a tradition of nations and constitutions, laws and regulations which are matured particularly in the areas of labour and environment, a culture of compliance, efficient enforcement mechanisms including penal law, a highly developed technical infrastructure, and a high level of education and inventive talents. European SMEs are known for practicing legal compliance as an inherent part of their social r esponsibility. In Europe, medium-sized enterprises count for up to 250 persons; small up to 50 and micro up to 10. Their annual turnover does not exceed €50 million, or their annual balance sheet total does not exceed €43 million. The vast majority of the 20 million European SMEs are characterised by personal ownership, being owner-managed with only informal structures. Some 10% of them export products and services, while most European SMEs are embedded locally and their society related behaviour is continuously scrutinized by the community in which they operate. The specific strength of European SMEs is the personalized relation to their environment. 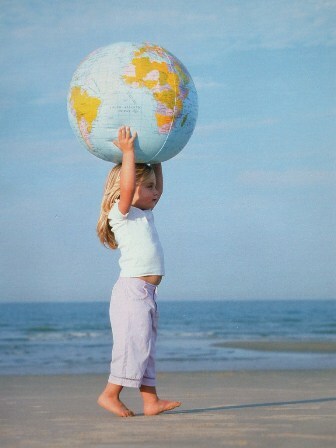 Via the owners’ and managers’ personal contribution they can give the future a face. CSR addresses the voluntarily responsible behaviour of enterprises towards society and presupposes legal compliance. Societies differ: by nation, history, culture, language, religion, level of education, way of thinking, density of regulation and other factors. In European nations many CSR related activities are regulated, a significant distinction from other regions. Different societies want to develop but also to maintain their special character. So, behaving in a socially responsible manner is something full of dynamic because societies’ needs and demands are locally specific and subject to continuous change. While economic success and prosperity are crucial prerequisites for unfolding contributions to society, the key question is: what can a European SME contribute to the development of its society? The answer is specific to each SME and its particular situation, its possibilities and the currently prioritised needs of "its" society. 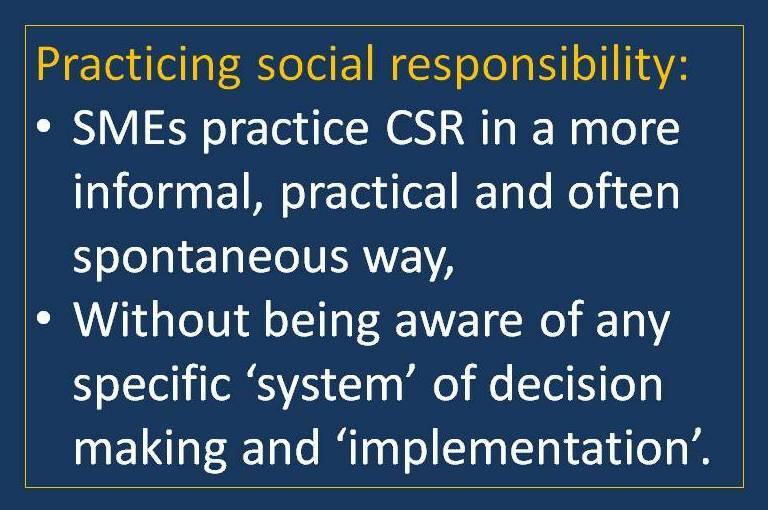 Why should SMEs practice CSR? A higher acceptance within the community because CSR makes an SME adapt more quickly to the needs of its environment including its clients. How can this user guide help? This user guide intends to help identify those ISO 26000 recommendations, wh ich are relevant for European SMEs. It does not intend to prescribe additional requirements or burden, since practiced CSR is aligned with existing business purposes. Next to this analysis of possible actions, a collective approach, e.g. via employer federations or chamber organisations, is recommended. These organisations may also be helpful in representing the SME viewpoint to government and other interested networking partners ("stakeholders"). The basic principles of social responsibility for small and medium-sized enterprises are accountability, transparency, and ethical behaviour as well as communication within the network of people, groups and organisations that have an interest in the SME. Accountability means that the SME is willing to take responsibility for the impact it may have on its specific environment. The owner or manager should be able to explain and justify the decision he or she takes. Accountability is important in the case of decisions which affect clients, employees, suppliers, neighbours or the local community in important economic, social and environmental aspects. Accountability also is the willingness and ability to revise and correct wrong decisions, take responsibility for damage caused and adopt preventive measures. It helps enterprises make these decisions understood and therefore is a way to enhance credibility and reputation. to clients asking for an explanation for recent changes in the enterprise’s pricing policy. Transparency means to make information available about the enterprise's decisions and activities regarding the relevant social, economic and environmental aspects of its operations. Such information can be made available on an ad hoc basis, but businesses may evaluate whether there is a legitimate and strong interest in having a more regular information flow to their clients, partners, employees or other people and organisations in their network. a day care centre for children reports on the ingredients and calories contained in the catering. An enterprise should behave ethically, meaning that all decisions should be taken and carried out in an honest, fair and reliable way, without accepting illegal benefits or conflicts of interest. This includes the economic operations of the enterprise as well as a concern for people and the environment. Ethical behaviour is being influenced a great deal by the personal values and sense of responsibility of the owner-manager, such as the willingness to treat other people as equals and with dignity, to keep his/her word or to help others. Only if ethical behaviour is being practiced continuously in daily life will it provoke reciprocity and trust, so that the receivers of ethical behaviour themselves adopt such attitudes. Fair competition: particularly on the local level reliable commercial practices are the basis for successful business environment, for example the absence of the deliberate deception of competitors. People in the community may give their support to an enterprise facing difficulties in response to assistance received from the enterprise. Active networking becomes an important principle for successful SMEs to ensure communication and resolve possible conflicts in a better way. An SME should identify who has an interest in its decisions and activities, so that it can understand its possible impact and how to address it. This should not be limited to clients and suppliers as every SME depends on an efficient infrastructure and society based network. Other individuals or groups may also have rights, claims or specific interests which might affect the daily work of the SME and should be taken into account. Each enterprise should consider itself as part of, and not separate to, its corresponding local or regional structure according to its size and abilities. Networking for SMEs can be described in different areas of activities. Each enterprise needs clients. Therefore it is necessary to understand their networks and values. SMEs should be informed about, and maintain contact with, groups and associations with which their clients have engagement. This may differ if the SME is a supplier for industrial clients or if it is more engaged with end-users in the local or regional area. SMEs are mainly shaped by the personality of its owner. Private and business activities are linked in many cases. Personal networks and local associations are important for the exchange of ideas. Many problems related to the daily work of an SME can only be solved through common efforts in an atmosphere of confidence. This includes the football club as well as the local business group to build up such networks based on trust, as everyone knows each other. Enterprises are part of society, e.g. neighbours and environmental groups monitor any possible change or disturbance when assessing an SME’s possible impact. The interests of the SME can be affected strongly by society based networks. Active engagement in public discussions improves the situation and helps to find adequate solutions and compromises. Due to the ongoing aging of western societies common efforts are needed to improve the professional development of employees and students. In close cooperation with schools and universities SMEs can benefit in getting better skilled workers. This offers many possibilities for SMEs to improve their public appearance and have access to new ideas and technologies. Networking is not a single action – it needs a continuous approach. Showing commitment is the main aspect in building trust for the exchange of information and joint actions. Internet presentation of the enterprise. According to ISO 26000 the core subjects of social responsibility are: organisational governance; human rights; labour practices; the environment; fair operating practices; consumer issues; community involvement and development. Other issues, such as economic factors, aspects relating to health and safety, the supply chain or gender issues are dealt with throughout the core subjects, where appropriate. An enterprise should look at all core subjects, though for SMEs not all core subjects and issues are equally relevant. There are two broad categories of human rights: The first concerns civil and political rights, and equality before the law. The second concerns economic, social and cultural rights, including the right to work, education, and food. Most human rights laws relate to the relationship between the state and the individual, but also private enterprises, including SMEs, may affect an individual’s human rights. In the European Union, the respect of human rights is a fundamental principle enshrined in the constitutions of member states as well as in several documents of the European Union such as the European Charter on fundamental rights. The legal protection of human rights is guaranteed by the rule of law and functioning juridical systems. Therefore, human rights issues will be of far less importance for European SMEs which operate mainly on a local, regional or national level than for those SMEs which are active worldwide especially in developing countries. Discrimination and vulnerable groups: An enterprise should address all social and especially vulnerable groups, to avoid exclusion and discrimination. Vulnerable groups can be women, people with disabilities, migrants and others. Conditions of work and social protection: An enterprise should ensure that working conditions comply with national law and/or standards set in collective agreements (e.g. wages, working hours, holidays, dismissal practices, maternity protection, and access to social security systems). Social dialogue: Depending on the existing legal framework and traditions on the national level, enterprises should respect and implement the results of social dialogue. Health and safety at work: To avoid work-related illness, injuries or death, an enterprise should develop, implement and maintain an occupational health and safety policy in line with or voluntarily beyond legal requirements. Human development and training: Enterprises should provide workers with access to skills development and training where feasible. Protection of ecosystems: An enterprise can act more socially responsible by protecting and restoring natural habitats and thus minimizing the possible impact of its activities. All of the environmental activities should be dealt with on a local and regional level in cooperation with concerned parties. Promoting social responsibility in the value chain: An enterprise should as far as possible encourage other enterprises to integrate ethical, social, environmental, and gender equality criteria in their policies. Information: Enterprises should inform consumers on all relevant health and safety aspects. Enterprises should provide for cooperative methods of dispute settlement in order to improve client relationships. Social investment: Enterprises should invest or engage in programmes aimed at improving social aspects of community life (related to education, training, culture, health). They should consider partnering with communities, governments, business or non-governmental organisations (NGO) to maximise synergies. 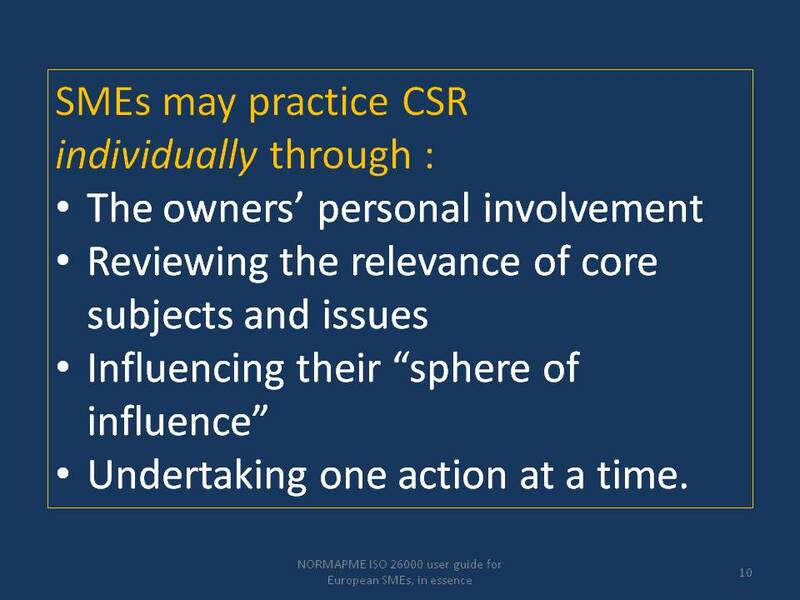 SMEs practice CSR in a more informal, practical and often spontaneous way. This does not necessarily imply a change to its processes. The owner may decide on processes and structures according to the requirements without being aware of any specific 'system' of decision making and implementation. Building CSR into an SME involves commitment and understanding, which should start at the top, this means by the owner. Successful engagement in CSR is based on the appropriate inclusion of employees. This may require specific information, measures, and training. This further includes regular opportunities for employees to express their ideas, suggestions or criticism. One action at a time: Once having identified the relevant core subjects, the issues and the sphere of influence, an SME can find that different aspects may be relevant to develop its activities. However, in order to avoid inefficiency, the SME should be careful in starting several initiatives at the same time. It should instead set priorities and accomplish one action at a time. For a single enterprise a collective approach may be helpful to be better perceived in society. 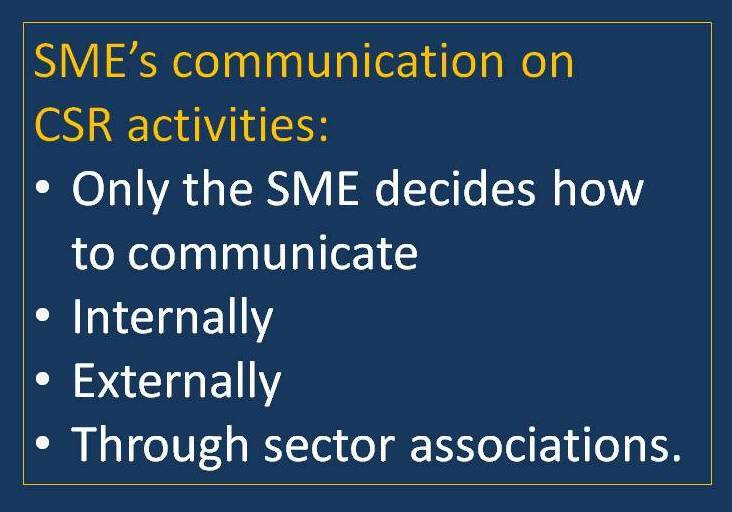 SMEs are encouraged to practice the collective approach either directly with other SMEs or associations. As a first step an SME has to decide which association may be most relevant to it. Transparency and democratic decision-making are basics for any SME-relevant association. In the public view SMEs are recognised as part of the specific sector they are working in. They are affected not only by local or regional interests but have to cope with a wide range of legal obligations developed on a national or European level. Collective agreements on wages and working conditions for employees are often agreed via national federations. Common local interests should be organised and presented by regional professional associations. “Spokesperson” of their SME members for various topics, including contacts with government, unions, and other associations. 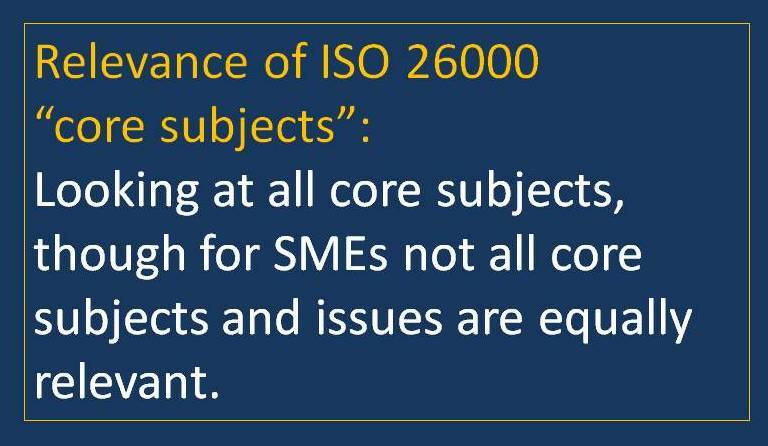 Communication on the responsible use of ISO 26000 is of crucial importance. However, it’s up to every enterprise to decide how to communicate, depending on its resources and priorities. Communicating on CSR can be very positive both for the internal and the external image of an SME: it allows for engagement in dialogue with interested parties, and it can motivate employees. In order to communicate effectively, information should be complete, understandable, accurate, timely and accessible. Organising events to draw attention to an exemplary initiative on responsibility. Communication can adopt different forms including meetings, public events, newsletters, advertising, reports or blogs, to name just a few. Through sector associations communication can be enhanced significantly. In a common approach the following actions can be taken into account: public statements, responsible lobbying and using media relations, coordination with important national interested parties, and common projects on the national or regional level. 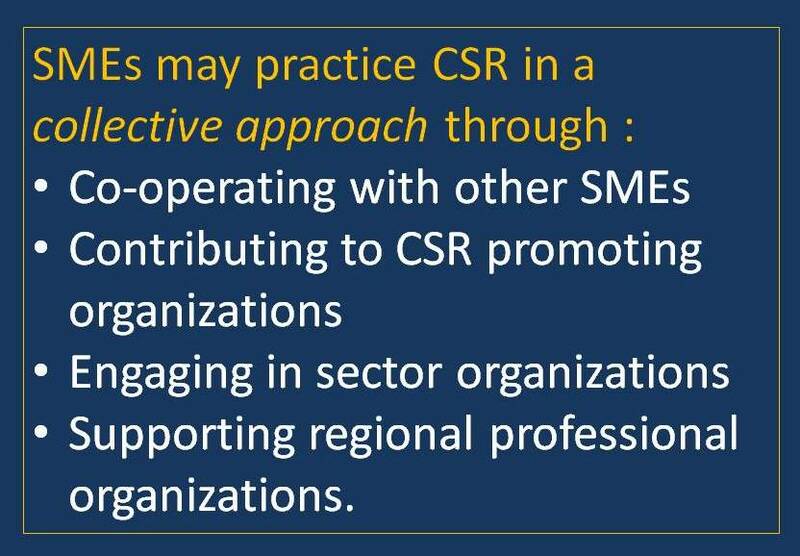 examples of SME activities in CSR.